Biren Das is a veritable repository of Baul-Fakiri tattwa songs and one of the most respected Baul veterans alive today. He was born in the 1940s in Jhinaidaha, Bangladesh - a region well-known for its Baul-Fakiri tradition and the home of many luminaries from Panju Shah to Bijoy Sarkar. He received his musical tutelage under Khodabaksh Shah and Sabdar Shah in Lalon`s tradition. 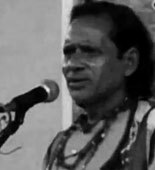 Affected by the violence and political turmoil of `71 during Bangladesh’s struggle for independence, Biren Das later came across the border and stayed for a long time in Hariharpara, Murshidabad and became well-known as a palla singer who was equally comfortable in Vaishnav and Islamic discourse. Now he lives in Chilekhali-Daspara in Tehatta, Nadia.